This is a really special 3D Christening cake for a mom expecting a little girl! Not only is she absolutely cute and adorable, she tastes amazing too. 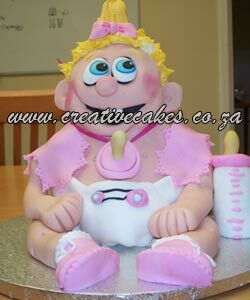 Make your loved ones baby shower something she will never forget and order this life like cartoon baby girl cake from Creative Cakes.